ESTELITE® SIGMA QUICK is a universal, 100% spherically filled composite, with a filler weight of 82% - 71% volume.With Estelite Sigma Quick the best just got better; offering all the same characteristics of Estelite Sigma with the addition of three new benefits. Compared to Estelite Sigma, Estelite Sigma Quick offers a reduced curing time - by one third and an extended working time - 90 seconds under the dental light by utilizing Tokuyama's patented innovative initiator system "Radical Amplified Photopolymerization - RAP Technology". 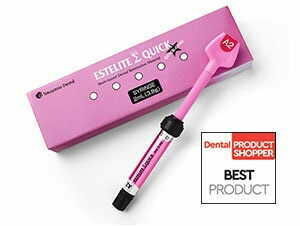 Estelite Sigma Quick also has three new shades; A5, OPA2 - Opaque, and WE - White Enamel, a new bleach shade.